When I entered the class, I saw some familiar and friendly faces, so I immediately felt at ease and not judged like you can sometimes feel in a gym atmosphere or when being the “new person” in a class. I grabbed a fresh towel and selected a pair of small weights (they size from one pound to three pounds). I then selected my bike. I told Luchi, the instructor, that it was my first class, and she was very helpful and kind in showing me how to adjust the bike and in explaining how the class works, although it is also fairly easy to figure out on your own. Once we were all settled, the overhead lights went down low, making the room pretty dark, and some neon lighting came on, which immediately got me excited; I felt like I was in a cool night club or restaurant, not a fitness class. Then the music started, and it was an awesome playlist that made me want to dance and move! 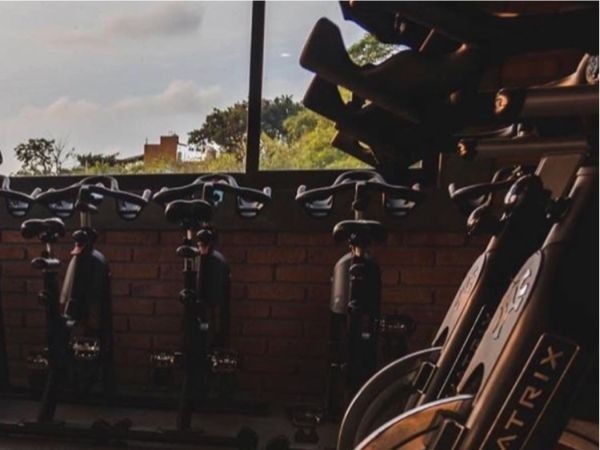 For most of the class, you cycle while standing and leaning forward, so it is a great workout not only for your legs, but also for your core muscles and arms. Furthermore, the point of the workout is to pedal along to the beat of the music, so you try to find the rhythm of each song. You can also adjust the amount of tension or resistance on the bike, making it harder or easier on your legs to pedal. Some of the songs are slower, and so you can pedal with more resistance to match the slower pace, and some are faster and thus you can pedal with a little less resistance. 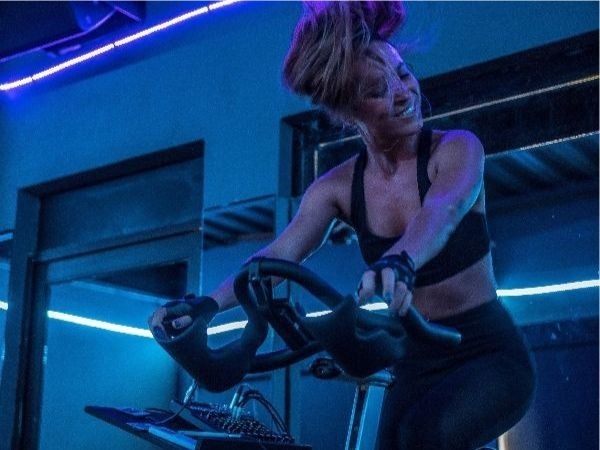 I was definitely feeling the burn after just the first few songs, but I felt comfortable in adjusting the bike and some of the movements so that I could easily accommodate to my level. It was also very easy to follow along with the instructor, and the moves were not hard to follow. Everything is simple and just goes with the music. If there were movements I felt like I couldn’t do (because my legs were hurting or I was running out of energy), I just adjusted and did my own thing, which was totally fine and not frowned upon. Along with pedaling on the bike, for some songs we used the weights to get a great arm workout. We also moved up and down on the bike, bending our forearms downward, moving our torso sideways, or moving our hands on the handlebars in different positions, always to the beat of the music, of course, so in a way it really felt like we were just dancing along to the songs. The enthusiasm from the instructor and the positive atmosphere of the room is really encouraging. I often heard people singing along to the music and shouting out words of motivation. This made the class go by so fast; because you’re constantly changing things up and are being motivated by the people around you, it never felt boring or repetitive/redundant. The class ended with a cool down song and a stretch. I was sore immediately after and could definitely feel the burn, but I was happy with the experience. Overall, this is a really fun class! I would definitely recommend this class to anyone who wants a high quality workout. It is a fun, energetic, encouraging, motivating class where you will feel comfortable yet challenged. It made me forget I was doing a “workout”. I can't wait to go back and take another revolution cycle class! The revolution cycle classes are growing quickly in popularity and filling up fast! SayulitaFit is offering a special 50% off discount for your first class exclusively for our El Sayulero Readers! Mention this article and promotion in order to receive your discount. 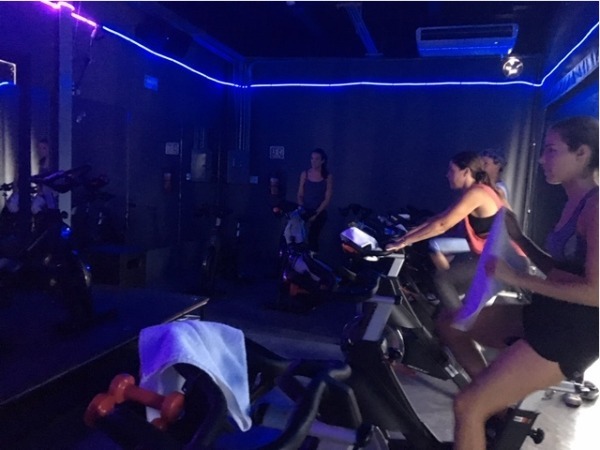 To find out more about revolution cycle, or to find information on the class schedules, please visit SayulitaFit’s Web page.